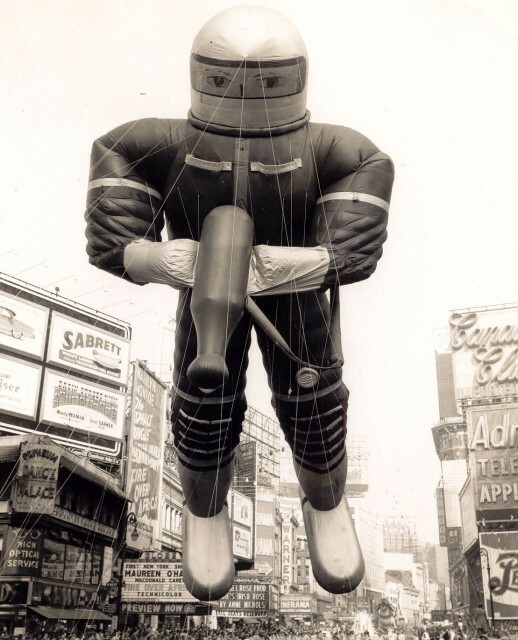 This Newsreel of the 1965 Macy’s Thanksgiving Day Parade features cast members from The Munsters and their custom “Munster Koach” hot rod built by George Barris. The “Koach” was a modified 1926 Ford Model T with a custom hearse body. It cost nearly $20,000 (a lot of money back then). Thus continued, with a little help from the monsters next door, a tradition of holiday spectacle in New York City dating back to 1924. 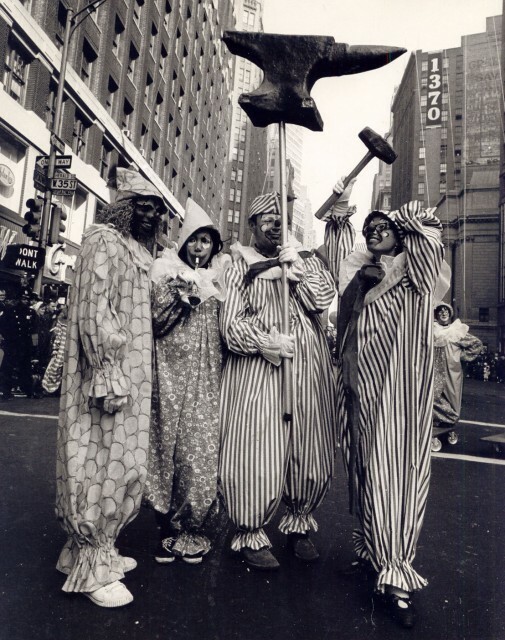 The first Macy’s Parade in New York City took place in 1924, featuring live animals, clowns, cowboys, and Macy’s employees in costume. It drew 250,000 people (a lot of people back then). Today more than 3.5 million attend the parade live and more than 50 million watch it on television. 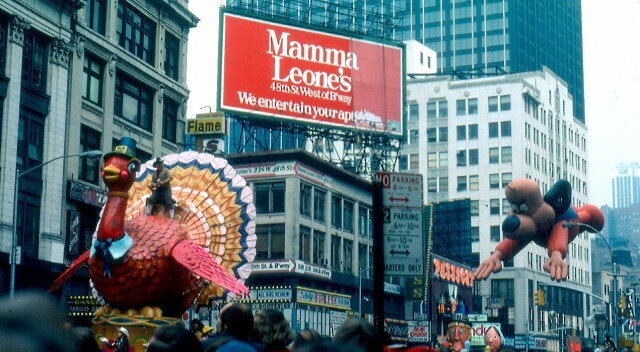 But the very first Macy’s Thanksgiving parade was arranged by founder Rowland H Macy in 1854 in Haverhill, Massachusetts the location of his very first dry goods store. 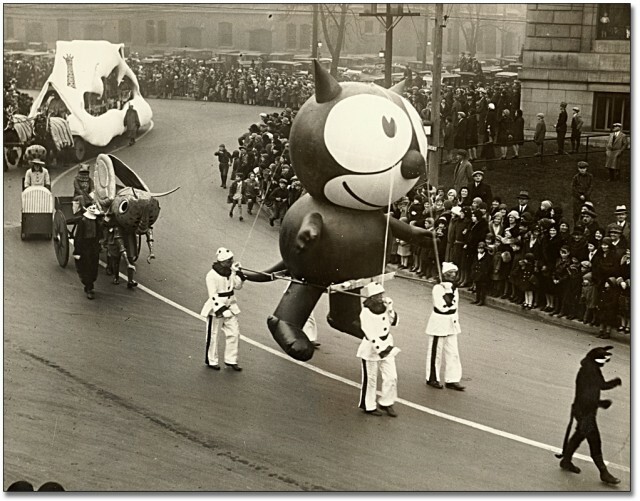 Live animals made way for giant floating animals in 1927 when Felix the Cat became the first of many many cartoon characters to appear as balloons in the parade. 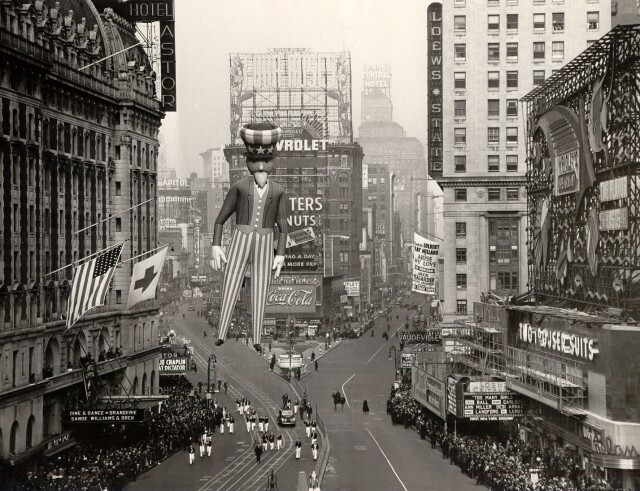 In 1928 they first filled the balloons with helium and released them into the air at the end of the parade. Unfortunately they all soon popped loudly above the crowd. The next they were made durable enough to float around for a few days after being released, and had a mailing address on them so they could be returned (in exchange for a gift from Macy’s). Mickey Mouse debuted in 1934. 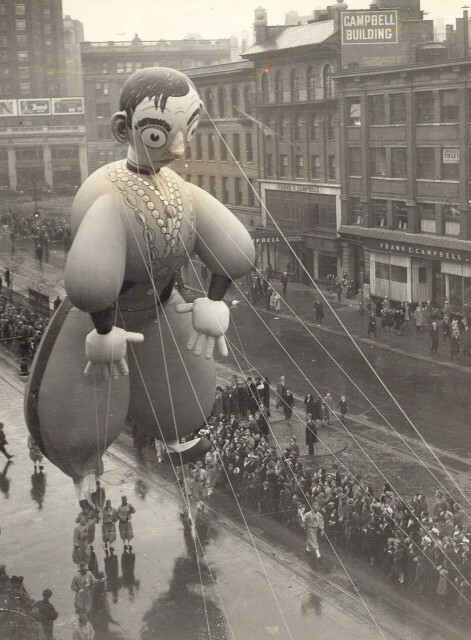 This remarkable 1935 British newsreel shows his buddy Donald in the parade, too. Get ready for a very un-PC representation of a Native American and a short bit at the end of President FDR carving the turkey. 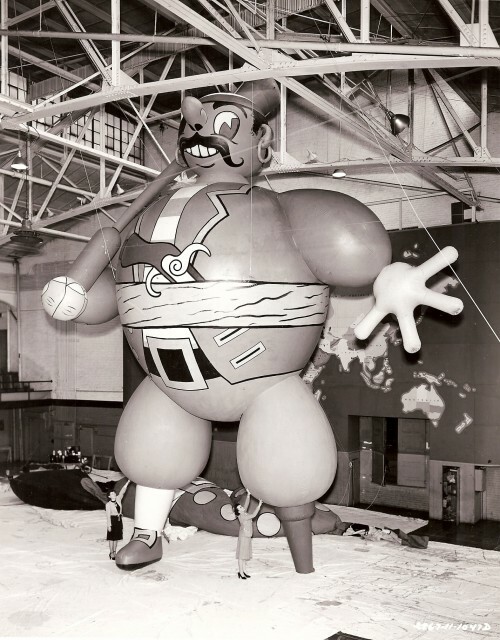 Macy’s hired German-American puppeteer Tony Sarg to design the balloons in-house. 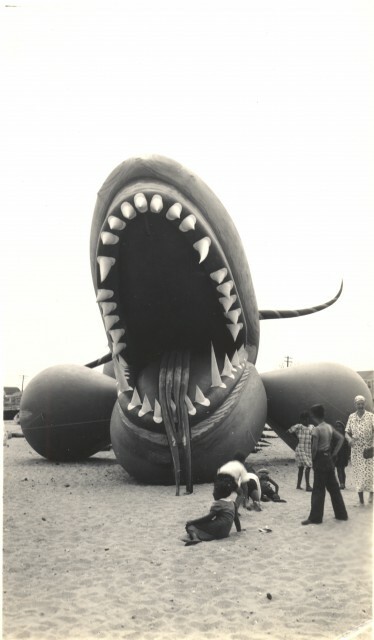 He oversaw the creation of original balloons like the “sea-serpent” below. 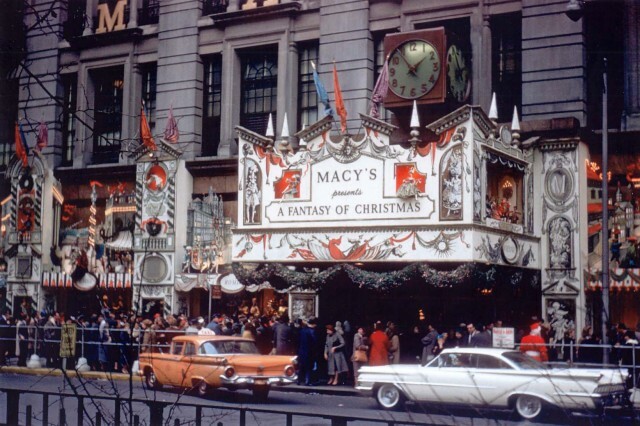 Sarg worked on the parade through the 1930s and also designed Macy’s elaborate animated holiday window displays. There’s a really cool children’s book about Sarg. 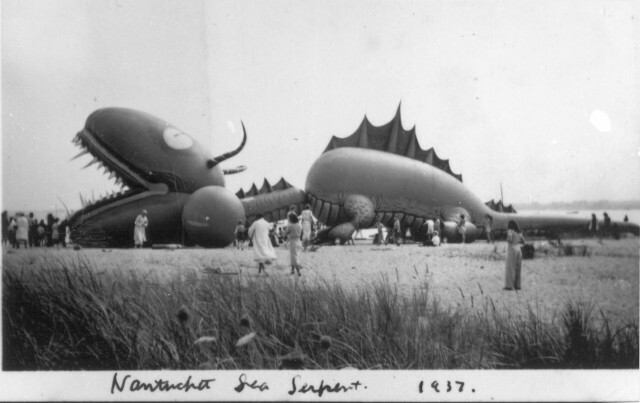 More photos of the sea serpent here. 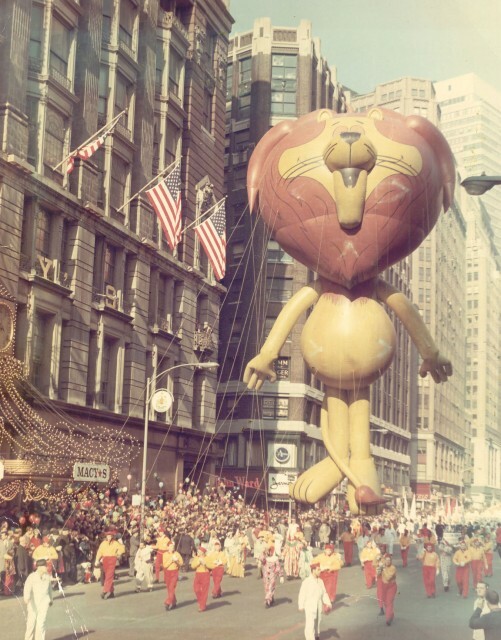 This 1939 footage of the parade features characters from Disney and the Wizard of Oz. See our previous post for more details about this rediscovered home movie. 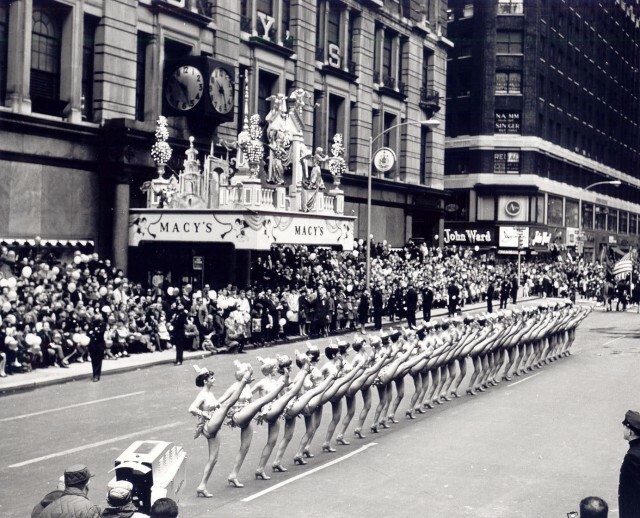 1939 was also the first year the parade was on television broadcast on New York’s W2XBS as an experimental broadcast with Tony Sarg as a host. In this 1954 8mm home movie shot near Times Square you’ll see Felix the Cat still in the show 27 years after his debut. There are many more videos of recent years on YouTube. But that’s not always a good thing. Do you remember the live Rickroll we blogged a few years back? Or this horror from 1984 when Tim Conway and The Cabbage Patch Kids gave us this utterly forgettable musical number. What’s next? Well according to the Hollywood Reporter there may be a feature film about the parade in the works. The duo have begun meeting with writers and are exploring various concepts, even one where the floats spring to life. To convince the department store to bless the project, Glassgold and Brothers commissioned artist Joel Venti, who storyboarded Night at the Museum: Battle of the Smithsonian and Thor, to help with the presentation, which won over Macy’s execs. “We are always searching for the next Miracle on 34th Street,” says Macy’s senior vp Robin Hall. 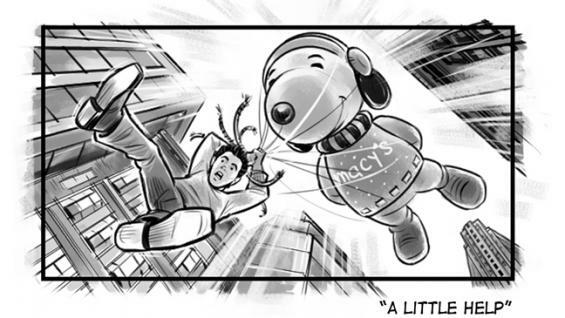 The article is from 2011, but this IMDB listing suggests there could be something to it: Untitled Macy’s Parade Project (2013).